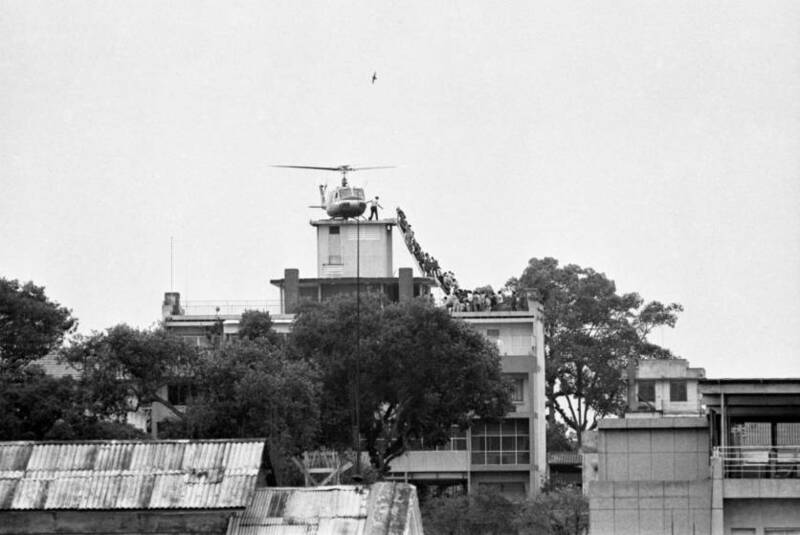 It has been 40 years since the spring day when the last U.S. helicopters lifted up and, shortly after, the North Vietnamese army entered Saigon, deciding a conflict that had raged for years. News photographs from the time showed the world what was going on, from a country full of death in all its gruesome forms to peaceful protests across the ocean. Despite their age, those images have not lost their impact. The Reverend Thich Quang Duc, a 73-year-old Buddhist monk, is soaked in petrol before setting fire to himself and burning to death in front of thousands of onlookers at a main highway intersection in Saigon, Vietnam, June 11, 1963. He had previously announced that he would commit suicide in protest against what he called government persecution of Buddhists. (AP Photo/Malcolm Browne). 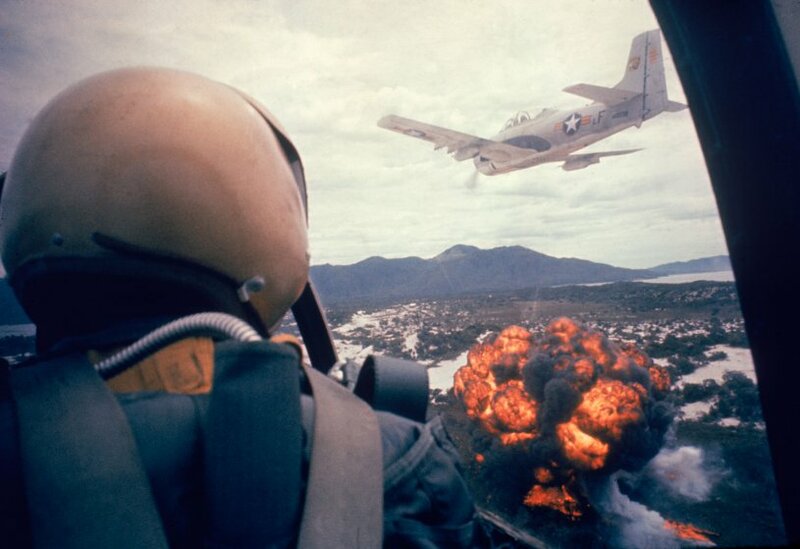 American jets dropping napalm on Viet Cong positions early in the Vietnam conflict. 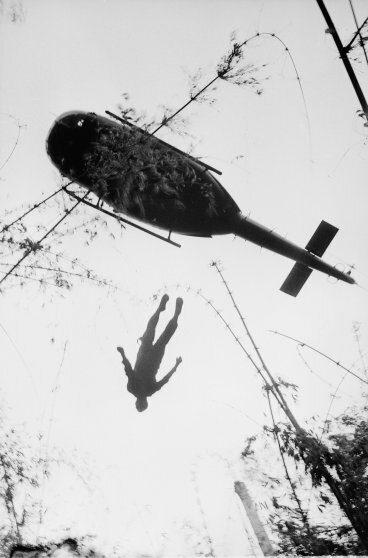 (Larry Burrows—The LIFE Picture Collection/Getty Images). 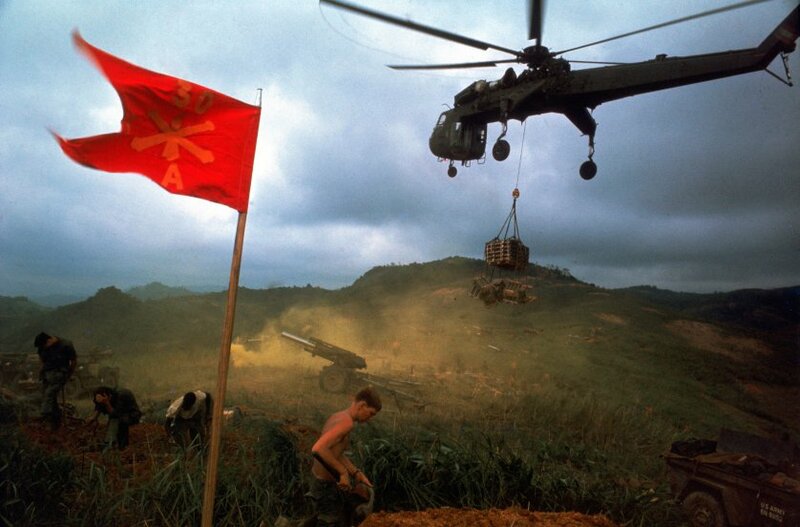 Hovering U.S. Army helicopters pour machine gun fire into the tree line to cover the advance of South Vietnamese ground troops in an attack on a Viet Cong camp 18 miles north of Tay Ninh, northwest of Saigon near the Cambodian border, in March 1965 during the Vietnam War. (AP Photo/Horst Faas). 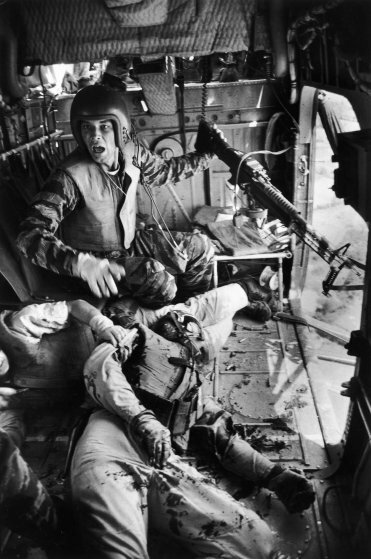 Helicopter crew chief James C. Farley (L) w. jammed machine gun shouting to crew as wounded pilot Lt. James Magel lies dying beside him. 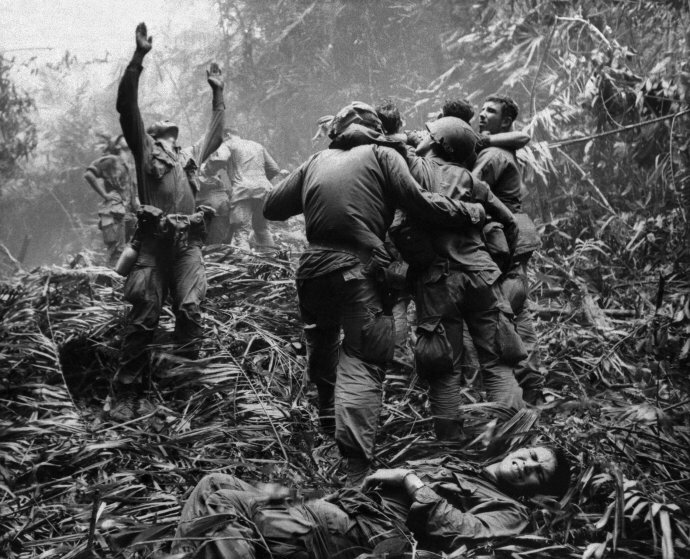 (Larry Burrows—The LIFE Picture Collection/Getty Images). 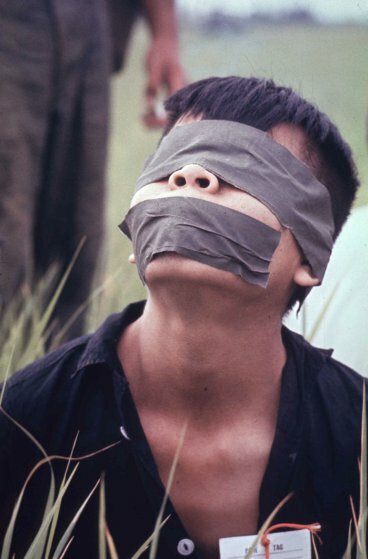 Vietcong prisoner captured during Cape Batangan battle, under guard (w. eyes & mouth taped shut) awaiting transfer to US POW compound. (Paul Schutzer—The LIFE Picture Colleciton/Getty Images). 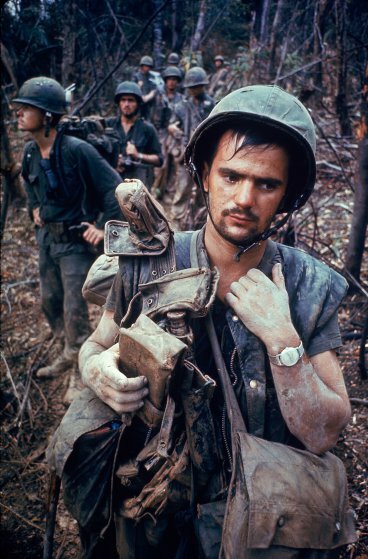 Dirty, exhausted looking US Marine on patrol with his squad near the DMZ during the Vietnam War. 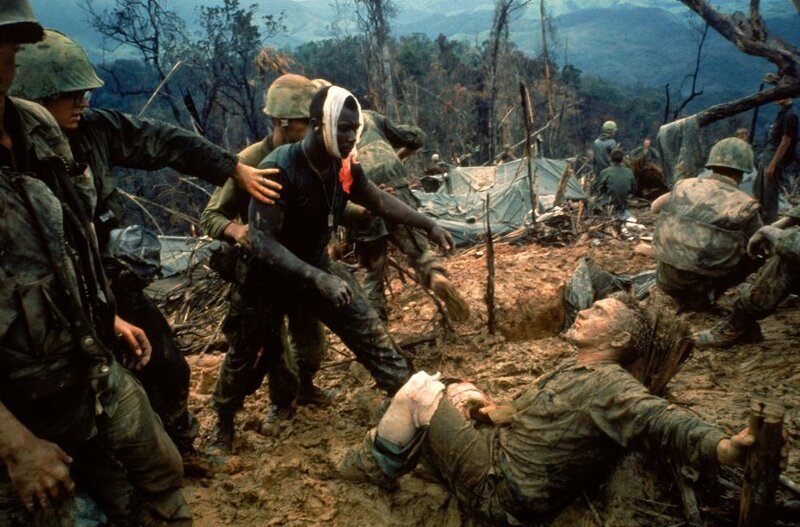 (Larry Burrows—The LIFE Picture Collection/Getty Images). Wounded Marine Gunnery Sgt. Jeremiah Purdie (C) being led past stricken comrade after fierce firefight for control of Hill 484 south of the DMZ. (Larry Burrows—The LIFE Picture Collection/Getty Images). USA. Washington DC. 1967. 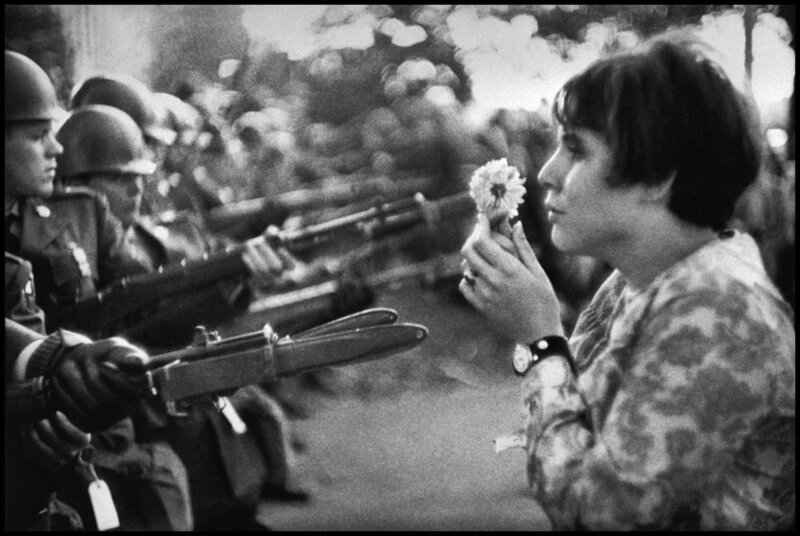 An American young girl, Jan Rose KASMIR, confronts the American National Guard outside the Pentagon during the 1967 anti-Vietnam march. This march helped to turn public opinion against the US war in Vietnam. (Marc Riboud—Magnum Photos). South Vietnamese General Nguyen Ngoc Loan, chief of the National Police, fires his pistol into the head of suspected Viet Cong officer Nguyen Van Lem (also known as Bay Lop) on a Saigon street, Feb. 1, 1968, early in the Tet Offensive. (AP Photo/Eddie Adams). Grieving widow crying over plastic bag containing remains of husband recently found in mass grave – killed in Feb. 1968 Vietnam war Tet offensive. (Larry Burrows—The LIFE Picture Collection/Getty Images). 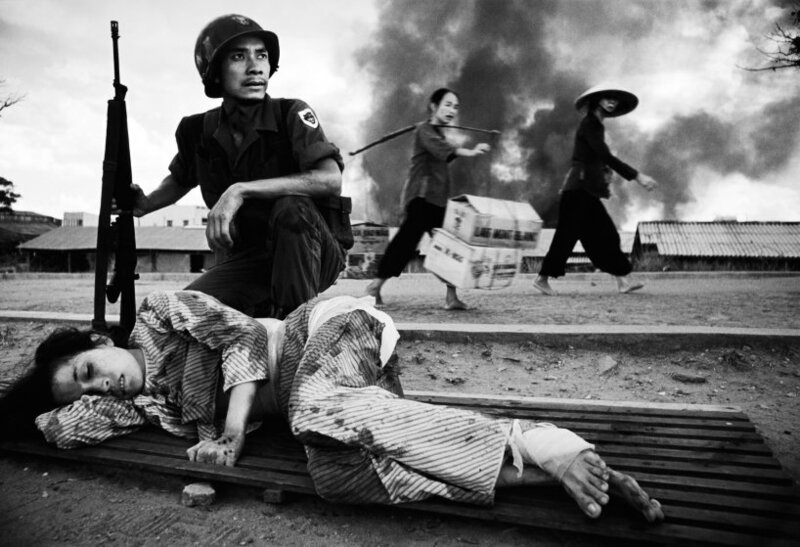 The battle for Saigon. 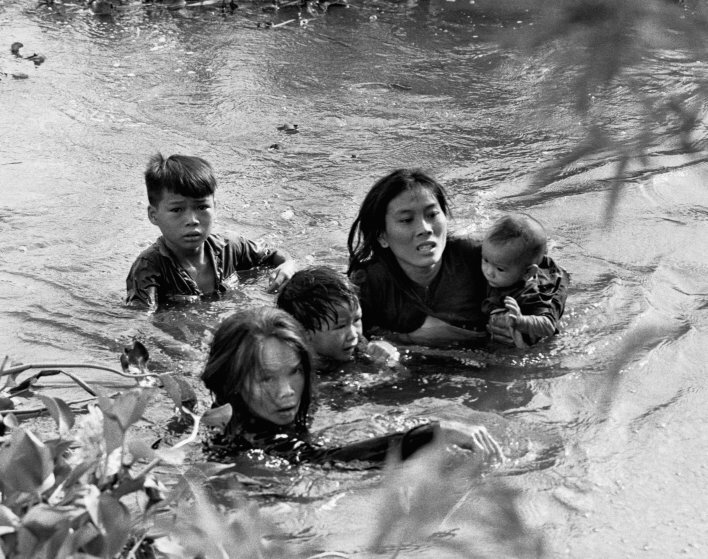 U.S. policy in Vietnam was based on the premise that peasants driven into the towns and cities by the carpet-bombing of the countryside would be safe. Furthermore, removed from their traditional value system they could be prepared for imposition of consumerism. This “restructuring” of society suffered a setback when, in 1968, death rained down on the urban enclaves. (Philip Jones Griffith—Magnum Photos). 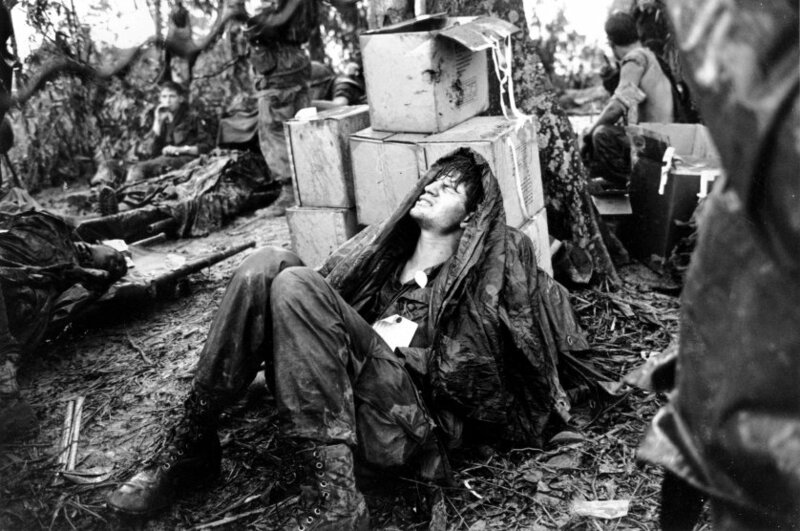 In this May 19, 1969 file photo, a wounded U.S. paratrooper grimaces in pain as he awaits medical evacuation at base camp in the A Shau Valley near the Laos border in South Vietnam on May 19, 1969 during the Vietnam War. It took nearly five years of tortuous negotiations by two U.S. administrations to hammer out the 1973 Paris Peace Accords aimed at ending the Vietnam War. The deal allowed the United States to extricate from the divisive conflict. But it had little effect for the Vietnamese, who faced two more years of war until North Vietnamese forces stormed the South Vietnamese capital of Saigon and ended the fighting on their terms – a united Vietnam under Communist rule. (AP Photo/Hugh Van Es, File). South Vietnamese forces follow after terrified children, including 9-year-old Kim Phuc, center, as they run down Route 1 near Trang Bang after an aerial napalm attack on suspected Viet Cong hiding places, June 8, 1972. 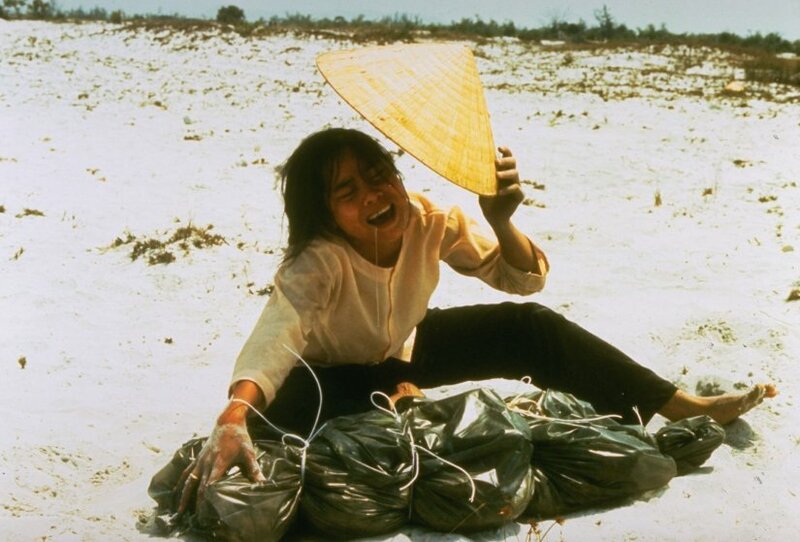 A South Vietnamese plane accidentally dropped its flaming napalm on South Vietnamese troops and civilians. The terrified girl had ripped off her burning clothes while fleeing. The children from left to right are: Phan Thanh Tam, younger brother of Kim Phuc, who lost an eye, Phan Thanh Phouc, youngest brother of Kim Phuc, Kim Phuc, and Kim’s cousins Ho Van Bon, and Ho Thi Ting. Behind them are soldiers of the Vietnam Army 25th Division. (AP Photo/Nick Ut). Released prisoner of war Lt. Col. Robert L. Stirm is greeted by his family at Travis Air Force Base in Fairfield, Calif., as he returns home from the Vietnam War, March 17, 1973. In the lead is Stirm’s daughter Lori, 15; followed by son Robert, 14; daughter Cynthia, 11; wife Loretta and son Roger, 12. (AP Photo/Sal Veder).